We have an exciting technical update to share! 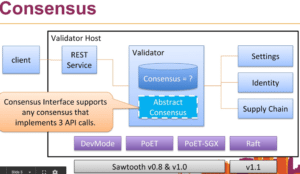 Hyperledger Sawtooth now supports dynamic consensus. That means you can easily change all blockchain settings by submitting a transaction to the network – including changing the consensus algorithm on the fly. This transition happens, like all state, at the block boundary. When we designed our 0.8 architecture this year a big part of it was putting all blockchain configuration on the chain itself. That includes the selection of consensus algorithm. The benefit is you can start a network with a small-scale or lax byzantine consensus algorithm and change as your network grows. And that change does not require you to stop all validators, flush your state, and start over with a new genesis block. There’s no outage at all involved in changing consensus. 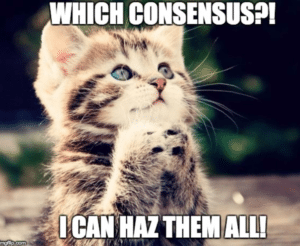 Coordination among peers to change consensus is implicit with this being a blockchain transaction. In our 0.8 stable builds you can submit transactions to change between DevMode, PoET, and PoET-SGX. The initial development to add Raft is underway. We anticipate adding full support for Raft after we get Hyperledger Sawtooth 1.0 release completed this year. 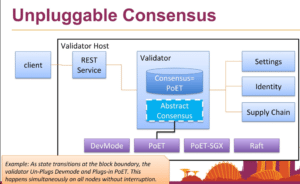 If you’re interested, you can learn more about Hyperledger Sawtooth and see real world examples of how the technology is being used. You can also read the documentation, join the community on RocketChat or pull the code from GitHub to kick the tires today.